The Town of Leader, Saskatchewan is home to less than 900 hardy, prairie folk. It’s located roughly between Saskatoon and Calgary, on an old ox cart trail (now Highway 32) near the border with Alberta. We happened to be spending the night en route to Oyen, Alberta, just over the border, to do some business and take a few pictures. After a pleasant night and robust breakfast at Grandma Shirley’s B&B, we stopped in at Rattler’s Café to read the paper and suss out some of the local colour. There’s always local colour. 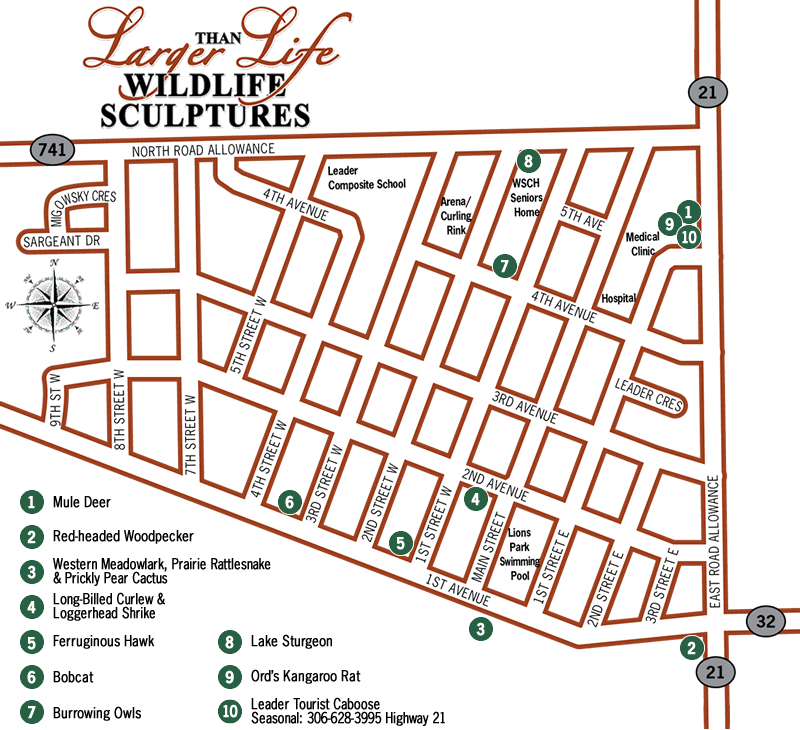 Turns out we should learn about the Smith Barn and take a look at the larger-than-life wildlife sculptures around town, so that’s what we did. 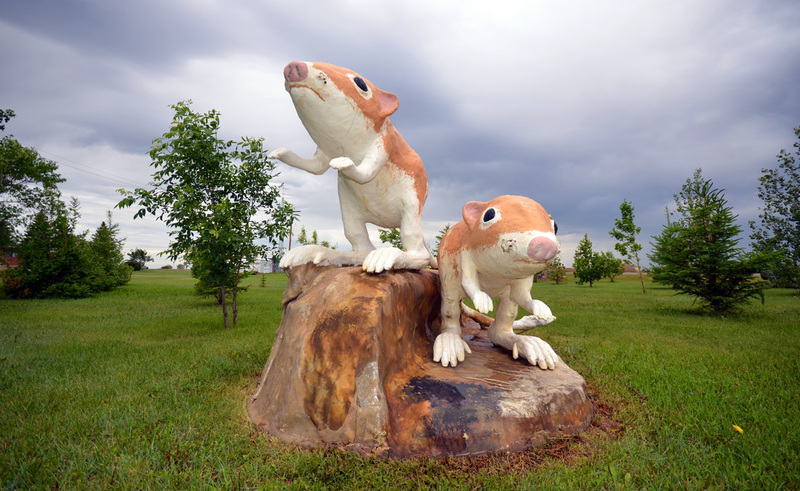 Back in 1992, the Town of Leader commissioned a local man by the name of Ralph Berg to build large, fiberglass representations of native animal inhabitants. The Mule Deer was first, followed every two or three years by yet another subject. Grant McLaughlin took over in 2000 with the Ferruginous Hawk after Ralph passed away. The most recent one (the Long-billed Curlew & Loggerhead Shrike) was hauled into place with a Bobcat in front of the town hall in 2009. We are long overdue for another installment. There are nine of them now. They’re fairly big. Well executed and colourful. Just one of many large Canadian roadside attractions, the Red-headed Woodpecker (2004) out in front of the Four L Motel has become something of a mascot for the Town of Leader. You can’t miss it as you drive in at the intersection of highways 21 and 32. We followed a map picked up at the local grocery and visited each sculpture (there’s a picture of each one in the gallery). This provided us not only with a little culture and education, but a fairly comprehensive tour of the town itself. In the summer, check out the Leader Tourist Caboose, where they will tell you all about the Smith Barn. Back in the day, in a land where almost everybody needed a barn, W.T. “Horseshoe” Smith’s barn was the biggest barn on the planet. That’s the way he liked it. But it didn’t turn out so well for Mr. Smith. Turned out that keeping thousands of animals in an enclosed space, in a land where the annual temperatures can vary by 80 degrees, before modern ventilation, was not really an improvement over yer average ol’ barn. Moisture and mortgage problems preceded the Smith Barn’s demolition in 1921, but you can still see the massive foundation footprint and a scale model in Leader. Please be careful. This isn’t Disneyland… there are no concession stands and rattlesnakes have been spotted on occasion. There is plenty to do in this part of Saskatchewan. The Great Sandhills are not far to the south and the Muddy Badlands are a world apart in Saskatchewan’s Great Southwest. Contact Tourism Saskatchewan for travel tips and insights.